Overweight but attractive teenage girl seen as a background character in Daria, and part of Daria's year. She never speaks and always wears a set of headphones with a cord that one assumes is connected to a Walkman, even during a lesson - and it's tolerated by teachers. Most of her appearances shown her on her own, with the same vaguely contented expression; she appears to be an introverted loner, but not bothered about this. She was several times seen in the company of Angel though, indicating the two are friends. 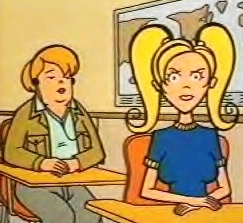 In "The New Kid", she was a member of the Yearbook staff, and in "Is It Fall Yet?" she helps pack things in DeMartino's class. Dawn was present at a Push Comes to Love college prep course in "College Bored," probably made to go by her parents. In a disturbingly unexplained scene in "The F Word", after being tasked to pick something she knew she'd fail at, Dawn is seen mournfully reading The Bell Jar, a semi-autobiographical book about clinical depression. She had the supreme misfortune to be present when Jane found out Daria had kissed Tom in "Dye! Dye! My Darling", and looked upset at the sight. She was based on a former MTV staffer named Dawn, who went on to join the police force. She seems to have been popular with MTV's animators as a result, clocking up a large number of episode appearances (from "Esteemsters" to graduation in Is It College Yet?) and two Alter Egos. Dawn has rarely appeared in fanfiction at all. Her first appearance appears to have been in 2007 in TAG's "A Hard Days' Night," as the owner of J.B., the talking bulldog. She then appeared in BlackHole's "Size Does Matter" (started in 2008), which had Dawn as a secondary character: a lesbian who runs the Rainbow Society, Lawndale High's LGBT club. In early 2011, she appeared in The Excellent S' Lawndale Fighting Championship series as a crowd-favourite pro wrestler who is able to compete with men (and do very well) due to her size. This series also gave her a surname (Harris). She also appeared in a bleak ficlet, "They Don't Cry", by RX-87. This page was last edited on 28 April 2018, at 17:22.